Groundwater or ground water is water located within the ground's zone of saturation, where the soil pore spaces and fractures in the rock are completely filled with water. It differs from soil water, which is the water that is in the unsaturated zone, or zone of aeration, where the soil pore spaces contain air and water but are not completely saturated. The term groundwater also has been used more broadly as any water beneath the earth's surface in soil; however, the above definition is aligned with those provided by such sources as the U.S. Geological Survey, New York State Dept. of Environmental Conservation, and Pennsylvania Groundwater Policy Education Project. The depth at which soil pore spaces or fractures and voids in rock become completely saturated with water is called the water table; in other words, below the level of the water table the soil pores and rock fractures are saturated with water. 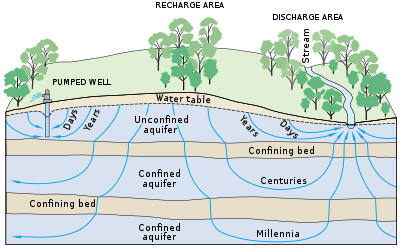 An aquifer is a layer within the zone of saturation that can readily yield and store water, such as in interconnected spaces (fractures, cracks, poor spaces, etc.) that can provide a source of water for a well. As part of the hydrologic cycle, groundwater stores and transmits water that has filtered down from the surface and it also slowly flows back to the surface, with natural discharge at places such as springs, seeps, and wetlands. Groundwater discharging into a stream provides water to allow the stream to flow throughout the year. Groundwater also is withdrawn for agricultural, municipal, and industrial use by constructing and operating extraction wells. Although a vitally important renewable resource, that serves many critical economic and environmental needs, groundwater reserves in various regions face such threats as depletion from overdraft and contamination. Dzherelo, a common source of drinking water in a Ukrainian village. The term groundwater has been loosely applied to any water beneath the earth's surface in soil, and thus including such features as soil moisture and permafrost (frozen soil) within areas not completely saturated with water (unsaturated zone). However, the term has been applied more technically and specifically to water below the water table, where the soil pore spaces and fractures in the rock are completely saturated with water (zone of saturation). The following are some definitions of groundwater and related terms. "Ground water. 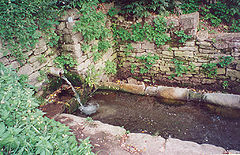 Water in the ground that is in the zone of saturation, from which wells, springs, and ground-water runoff are supplied." "Zone of aeration. The zone above the water table. Water in the zone of aeration does not flow into a well." "Zone of saturation. The zone in which the functional permeable rocks are saturated with water under hydrostatic pressure.. . Water in the zone of saturation will flow into a well, and is called ground water." New York State Department of Environmental Conservation (NYS-DEC 2013). "Groundwater: Water found in the spaces between soil particles and cracks in rocks underground located in the saturation zone. Cracks in rocks can be due to joints, faults, etc." "Saturated zone: Located immediately below the unsaturated zone (see definition below) where the pores are totally saturated with water. Same as 'groundwater'." "Unsaturated zone: Located immediately below the land surface where the pores contain both water and air, but are not totally saturated with water. Plant roots can capture the moisture passing through this zone, but it cannot provide water for wells. Also known as the unsaturated zone or vadose zone." "Water filtering through the soil moves first through an unsatruated zone... At this state water is called soil water and some of it will be taken up by plants. The rest of it continues, pulled by gravity, in a generally downward path and eventually reaches the zone of saturation. Here the poor spaces are completely filled with water; this is groundwater." 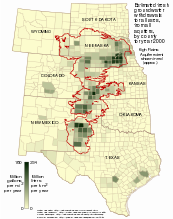 Groundwater withdrawal rates from the Ogallala Aquifer in the central U.S.
An aquifer is an underground geological formation in the zone of saturation that consists of a layer of porous substrate that can readily contain and yield groundwater. Aquifers can be classified as unconfined aquifers and confined aquifers. An unconfined aquifer is one whereby the water table is at or near atmospheric pressure and the water can flow directly to the surface. A well penetrating an unconfined aquifer would have the same water level as the water table outside the well. A confined aquifer or artesian aquifer is one whereby the groundwater is bounded within layers of impermeable substances like dense rock or clay and is very often under pressure. As such, if a well were to be tapped into a confined aquifer,the artesian pressure would force the water to rise in the well to a level higher than the water table, including sometimes above the land surface, as with an artesian well, where the water flows without the need of a pump (Stevens, n.d.; (NYS-DEC 2013). Aquifers also can be classified as consolidated aquifers and unconsolidated aquifers. A consolidated aquifer holds water in interconnected spaces between rock layers, fractures, small cracks, pore spaces, and/or solution channel openings. Limestone, granite, and sandstone are some of the rock types with consolidated aquifers. Limestone aquifers in particular can hold and yield substantial amounts of water, whereas granite small amounts, and sandstone moderate amounts. An unconsolidated aquifer involves rock debris or weathered bedrock where soil particles hold water in spaces between the particles. Clay and silt may hold a lot of water but release it very slowly, while coarse-grained sand and gravel may hold less water but release it more freely (Stevens, n.d.; (NYS-DEC 2013). There may be several diverse aquifers within the zone of saturation, separated by geological formations called aquitards. Aquitards are layers that resist the flow of water from one aquifer to another, such as with nonporous rock or clay with tiny, poorly connected pores (Stevens n.d.). An aquiclude is a substrate with porosity that is so low it is virtually impermeable to groundwater. The characteristics of aquifers vary with the geology and structure of the substrate and topography in which they occur. In general, the more productive aquifers occur in sedimentary geologic formations. By comparison, weathered and fractured crystalline rocks yield smaller quantities of groundwater in many environments. Unconsolidated to poorly cemented alluvial materials that have accumulated as valley-filling sediments in major river valleys and geologically subsiding structural basins are included among the most productive sources of groundwater. The high specific heat capacity of water and the insulating effect of soil and rock can mitigate the effects of climate and maintain groundwater at a relatively steady temperature. In some places where groundwater temperatures are maintained by this effect at about 10°C (50°F), groundwater can be used for controlling the temperature inside structures at the surface. For example, during hot weather relatively cool groundwater can be pumped through radiators in a home and then returned to the ground in another well. During cold seasons, because it is relatively warm, the water can be used in the same way as a source of heat for heat pumps that is much more efficient than using air. The water cycle—technically known as the hydrologic cycle—is the continuous circulation of water within the Earth's hydrosphere. The hydrosphere includes the atmosphere, land, surface water, and groundwater. As water moves through the cycle, it changes state between liquid, solid, and gas phases. Water moves through different reservoirs, including ocean, atmosphere, groundwater, rivers, and glaciers, by the physical processes of evaporation (including plant transpiration), sublimation, precipitation, infiltration, runoff, and subsurface flow. About twenty percent of the freshwater in the world is made up of groundwater (about 0.61% of the water in the world, including oceans and permanent ice). The storage of groundwater globally is approximately equal to the amount of freshwater stored in ice pack and snow worldwide, including the south and north poles. Thus, it is an important reservoir in the hydrological cycle and can help buffer against shortages in surface water and times of drought (UNESCO 2011). Groundwater deep underground and below oceans may be saline. There is an estimated 12.9 million cubic kilometers (3.1 million cubic miles) of saline groundwater, compared to about 10.5 million cubic kilometers (2.6 million cubic miles) of fresh groundwater (Gleick 1996). As part of the hydrologic cycle, groundwater is continually replenished from areas on the surface and itself is in movement back to the surface. The replenishment takes place as precipitation from rain and snow falls on the surface of the land and filters through the soil. That water that is not taken up by plants makes its way to the zone of saturation, becoming groundwater. Like surface water, groundwater continues to move, although more slowly due to the substrate through which it is moving. This speed may range from just a few inches per year to feet per day depending on the nature of the rock or soil through which it moves. The water moves from upland recharge areas to lowland discharge areas, where the water table meets the land surface and the gourndwater discharges back to the surface via springs, streams, lakes, wetlands, and so forth. Eventually, it will be cycled back to the atmosphere as the water evaporates from surface waters or is transpired by plants that pick up the water (Stevens). Groundwater can be a long-term "reservoir" of the natural water cycle (with residence times from days to millennia), as opposed to short-term water reservoirs like the atmosphere and fresh surface water (which have residence times from minutes to years). The Great Artesian Basin in central and eastern Australia is one of the largest confined aquifer systems in the world, extending for almost 2 million km2. By analyzing the trace elements in water sourced from deep underground, hydrogeologists have been able to determine that water extracted from these aquifers can be more than 1 million years old. By comparing the age of groundwater obtained from different parts of the Great Artesian Basin, hydrogeologists have found it increases in age across the basin. Where water recharges the aquifers along the Eastern Divide, ages are young. As groundwater flows westward across the continent, it increases in age, with the oldest groundwater occurring in the western parts. This means that in order to have traveled almost 1000 km from the source of recharge in 1 million years, the groundwater flowing through the Great Artesian Basin travels at an average rate of about 1 meter per year. Research has demonstrated that evaporation of groundwater can play a significant role in the local water cycle, especially in arid regions (Hassan 2008). Scientists in Saudi Arabia have proposed plans to recapture and recycle this evaporative moisture for crop irrigation. A 50-centimeter-square reflective carpet, made of small adjacent plastic cones, was placed in a plant-free dry desert area for five months, without rain or irrigation. It managed to capture and condense enough ground vapor to bring to life naturally buried seeds underneath it, with a green area of about 10% of the carpet area. It is expected that, if seeds were put down before placing this carpet, a much wider area would become green (Al-Kasimi 2002). Groundwater is a renewable resource that serves many critical economic and environmental needs. Economically, it is the source of drinking water for many communities (about half the population in the United States and nearly all the rural population), as well as providing water for agricultural and industrial needs (USGS 2013). Groundwater is also ecologically important. The importance of groundwater to ecosystems is often overlooked. Groundwaters sustain streams, wetlands, and lakes, as well as subterranean ecosystems within karst or alluvial aquifers. While a rain storm or snow melt can provide a lot of water for a stream, at other times of the year the stream is provided all the water by groundwater seeping through stream banks and stream beds (called base flow), allowing the streams to flow year round (Stevens). Not all ecosystems need groundwater, of course. Some terrestrial ecosystems—for example, those of the open deserts and similar arid environments—exist on irregular rainfall and the moisture it delivers to the soil, supplemented by moisture in the air. While there are other terrestrial ecosystems in more hospitable environments where groundwater plays no central role, groundwater is in fact fundamental to many of the world’s major ecosystems. Water flows between groundwaters and surface waters. Most rivers, lakes, and wetlands are fed by, and (at other places or times) feed groundwater, to varying degrees. Groundwater feeds soil moisture through percolation, and many terrestrial vegetation communities depend directly on either groundwater or the percolated soil moisture above the aquifer for at least part of each year. Hyporheic zones (the mixing zone of streamwater and groundwater) and riparian zones are examples of ecotones largely or totally dependent on groundwater. Two key issues facing groundwater reserves are (1) depletion of groundwater; and (2) contamination. Groundwater is depleted as is pumped out and used faster than it is replenished. This can have the effect of lowering the water table, which in tern can cause drying up of wells and the need for a well owner to deepen the well, lower the pump, or drill a new well, and greater energy costs for operation a pump; reduction of water that goes back into streams and lakes and loss of wildlife habitat and vegetation; and land subsidence. This last issue can arise when the loss of water causes soil to compact, collapse,and drop, and thus the loss of support below ground for structures on the surface (USGS 2013). Groundwater contamination can occur from a number of sources. Toxins can filter down and waste from landfills and agricultural runoff. As water tables are lowered, saltwater contamination can increase, as the freshwater/saltwater boundary is disrupted and saltwater migrates inward as well as upward from the saline groundwater. Furthermore, as water moves through the landscape, it collects soluble salts, mainly sodium chloride. As the water enters the atmosphere through evapotranspiration, these salts are left behind. In irrigation districts, poor drainage of soils and surface aquifers can result in water tables' coming to the surface in low-lying areas. Major land degradation problems of soil salinity and waterlogging result, combined with increasing levels of salt in surface waters. As a consequence, major damage has occurred to local economies and environments (Ludwig et al. 1993). Unlike river waters being overused and polluted, groundwater problems are less evident, as aquifers are out of sight. Another problem is that water management agencies, when calculating the "sustainable yield" of aquifer and river water, have often counted the same water twice, once in the aquifer, and once in its connected river. This problem, although understood for centuries, has persisted, partly through inertia within government agencies. In general, the time lags inherent in the dynamic response of groundwater to development have been ignored by water management agencies, decades after scientific understanding of the issue was consolidated. In brief, the effects of groundwater overdraft (although undeniably real) may take decades or centuries to manifest themselves. In a classic study in 1982, Bredehoeft and colleagues (Sophocleous 2002) modeled a situation where groundwater extraction in an intermontane basin withdrew the entire annual recharge, leaving "nothing" for the natural groundwater-dependent vegetation community. Even when the borefield was situated close to the vegetation, 30% of the original vegetation demand could still be met by the lag inherent in the system after 100 years. By year 500, this had reduced to 0%, signalling complete death of the groundwater-dependent vegetation. The science has been available to make these calculations for decades; however, in general water management agencies have ignored effects that will appear outside the rough time frame of political elections. Sophocleous (2002) argues that management agencies must define and use appropriate time frames in groundwater planning. This will mean calculating groundwater withdrawal permits based on predicted effects decades, sometimes centuries in the future. Over-use of groundwater, known as overdraft, can lead to depletion and cause major problems to human users and to the environment. The most evident problem (as far as human groundwater use is concerned) is a lowering of the water table beyond the reach of existing wells. As a consequence, wells must be drilled deeper to reach the groundwater; in some places (e.g., California, Texas, and India) the water table has dropped hundreds of feet because of extensive well pumping. In the Punjab region of India, groundwater levels have dropped 10 meters since 1979, and the rate of depletion is accelerating (Lall 2009). A lowered water table may, in turn, cause other problems such as groundwater-related subsidence and saltwater intrusion. Subsidence occurs when too much water is pumped out from underground, deflating the space below the above-surface, and thus causing the ground to collapse. The result can look like craters on plots of land. This occurs because, in its natural equilibrium state, the hydraulic pressure of groundwater in the pore spaces of the aquifer and the aquitard supports some of the weight of the overlying sediments. When groundwater is removed from aquifers by excessive pumping, pore pressures in the aquifer drop and compression of the aquifer may occur. This compression may be partially recoverable if pressures rebound, but much of it is not. When the aquifer gets compressed, it may cause land subsidence, a drop in the ground surface. The city of New Orleans, Louisiana is actually below sea level today, and its subsidence is partly caused by removal of groundwater from the various aquifer/aquitard systems beneath it. In the first half of the 20th century, the city of San Jose, California dropped 13 feet from land subsidence caused by overpumping; this subsidence has been halted with improved groundwater management. Iron oxide staining caused by reticulation from an unconfined aquifer in karst topography. Perth, Western Australia. Water pollution of groundwater, from pollutants released on the surface that can work their way down into groundwater, can create a contaminant plume within an aquifer. Movement of water and dispersion within the aquifer spreads the pollutant over a wider area, its advancing boundary often called a plume edge, which can then intersect with groundwater wells or emerge into surface water via such means as seeps and springs, making the water supplies unsafe for humans and wildlife. The interaction of groundwater contamination with surface waters is analyzed by use of hydrology transport models. The stratigraphy of the area plays an important role in the transport of these pollutants. An area can have layers of sandy soil, fractured bedrock, clay, or hardpan. Areas of karst topography on limestone bedrock are sometimes vulnerable to surface pollution from groundwater. Earthquake faults also can be entry routes for downward contaminant entry. Water table conditions are of great importance for drinking water supplies, agricultural irrigation, waste disposal (including nuclear waste), wildlife habitat, and other ecological issues. In the United States, upon commercial real estate property transactions both groundwater and soil are the subjects of scrutiny, with a Phase I Environmental Site Assessment normally being prepared to investigate and disclose potential pollution issues. In the San Fernando Valley of California, real estate contracts for property transfer below the Santa Susana Field Laboratory (SSFL) and eastward have clauses releasing the seller from liability for groundwater contamination consequences from existing or future pollution of the Valley Aquifer. Love Canal was one of the most widely known examples of groundwater pollution. In 1978, residents of the Love Canal neighborhood in upstate New York noticed high rates of cancer and an alarming number of birth defects. This was eventually traced to organic solvents and dioxins from an industrial landfill that the neighborhood had been built over and around, which had then infiltrated into the water supply and evaporated in basements to further contaminate the air. Eight hundred families were reimbursed for their homes and moved, after extensive legal battles and media coverage. Another example of widespread groundwater pollution is in the Ganges Plain of northern India and Bangladesh where severe contamination of groundwater by naturally occurring arsenic affects 25% of water wells in the shallower of two regional aquifers. The pollution occurs because aquifer sediments contain organic matter that generates anaerobic conditions in the aquifer. These conditions result in the microbial dissolution of iron oxides in the sediment and, thus, the release of the arsenic, normally strongly bound to iron oxides, into the water. Al-Kasimi, S. M. 2002. Existence of ground vapor-flux up-flow: Proof & utilization in planting the desert using reflective carpet. Pages 105-119 in Proceedings of the Saudi Sixth Engineering Conference, Volume 3. Gleick, P. H., 1996. Water resources. Pages 817-823 in S. H. Schneider (ed. ), Encyclopedia of Climate and Weather, vol. 2. New York: Oxford University Press. ISBN 0195104412. Hassan, S. M. T. 2008. Assessment of groundwater evaporation through groundwater model with spatio-temporally variable fluxes. M.S. Thesis. International Institute for Geo-Information Science and Earth Observation (Enschede, Netherlands). Retrieved January 5, 2014. Lall, U. 2009 Punjab: A tale of prosperity and decline. State of the Planet July 28, 2009. The Earth Institute, Columbia University. Retrieved January 5, 2014. Langbein, W. B., and K. T. Iseri. 1960. General introduction and hydrologic definitions. In Langbein and Iseri, Manual of Hydrology: Part 1. General Surface-Water Techniques. Geological Survey Water-Supply Paper 1541-A. Washington, D.C.: United States Government Printing Office. Retrieved January 3, 2014. Ludwig, D., R. Hilborn, and C. Walters. 1993. Uncertainty, resource exploitation, and conservation: Lessons from history. Science 260(5104): 17–36. PMID 17793516. Meinzer, O. E. 1923. Outline of ground-water hydrology, with definitions. U.S. Geol. Survey Water-Supply Paper 494. Meinzer, O. E. (ed.). 1949. Physics of the Earth. IX. Hydrology. New York: Dover. New York State Department of Environmental Conservation (NYS-DEC). 2013. Groundwater definitions. NY State Dept. of Environmental Conservation. Retrieved January 2, 2013. Sophocleous, M. 2002. Interactions between groundwater and surface water: The state of the Science. Hydrogeology 10: 52-67. Stevens, E. n.d. Groundwater. A primer for Pennsylvanians. Pennsylvania Groundwater Policy Education Project (PA-GPEP). Printed by League of Women Voters of Pennsylvania Citizen Education Found and Penn State Cooperative Extension. UNESCO Office in Tashkent. 2011. Scientists has discussed the role of underground waters. UNESCO. Retrieved January 4, 2013. United States Geological Survey (USGS). 2013. Groundwater depletion. USGS. Retrieved January 4, 2014. This page was last modified on 21 February 2014, at 17:33.